Refugees from Western Sahara hold up large portraits outside the Smara refugee camp near Tindouf, Algeria. Three United Nations agencies operating in Algeria appealed today for continued donor support for refugees from Western Sahara, warning that insufficient funding makes imminent a cut in basic food rations. “For more than 40 years, the Sahrawi refugees have been living under extremely harsh conditions in the Sahara desert in south-western Algeria. Hosted in five camps close to the town of Tindouf, they remain heavily dependent on external humanitarian assistance,” the UN World Food Programme (WFP), together with the Office of the UN Nations High Commissioner for Refugees (UNHCR) and the UN Children’s Fund (UNICEF) said in a joint news release. According to the release, WFP represents the most important source of food in the camps. The UN agencies caution that the halt or reduction of that assistance would have a severe impact on the refugees’ food security and nutritional status – especially young children, pregnant and nursing women, the elderly and the sick. “At the [UN Summit which] recently adopted the New York Declaration, States committed to providing additional and predictable humanitarian funding and development support for refugees,” said UNHCR Representative in Algeria Hamdi Bukhari. The joint statement explained that WFP faces a funding shortfall of $10 million for the next six months. While the UN food relief agency was forced to suspend part of its assistance in October, November threatens reduced rations by half. Stocks have already been depleted to cover the last few months and the three staple products of wheat flour, vegetable oil, and rice are quickly running out. WFP has informed donors, stakeholders and local partners – including the Algerian and Sahrawi Red Crescent – of possible cuts. On 19 September, WFP, UNHCR, UNICEF, the World Health Organization (WHO), as well as non-governmental organizations providing humanitarian assistance to Sahrawi refugees, called on donors in Algiers for funds to provide food, shelter, health and education in the camps. The appeal will be re-issued soon at a donor meeting in Geneva. “Sahrawi refugee children living in camps in Tindouf are highly dependent on food distributions, and anxiety among families about further reduction is high,” said UNICEF Representative in Algeria Marc Lucet. Since 1986, WFP has been supporting refugees from Western Sahara in Algeria. All of its assistance there is carried out and monitored in collaboration with national and international organizations to make sure the support reaches the people for whom it is intended. The Sahrawi crisis is the UN’s oldest protracted operation and the second longest-running refugee situation worldwide, said the agencies. 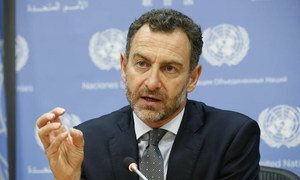 More than 9.2 million people in the Lake Chad Basin are in need of humanitarian assistance and more than 4.4 million face severe food insecurity, a senior United Nations relief official said today, appealing for greater efforts from the international community and development partners to meet the region’s growing needs.